What you should know, but perhaps never even thought to ask. There are essentially 3 different types of film now available on the market. Ventureshield Standard Film, Xpel Value, Avery Non Clearcoat. 3M Non Clearcoat (Not available in Europe), 2 PLY, Xpel Standard, 3M Scotch guard, Bekaert Clearshield, Ventureshield Ultra and Avery Clear Coat. Premium Film needs to be on a PLASTIC backing sheet not a paper backing sheet in the first instance. Xpel Premium certainly is. This decision comes into play where the “orange peel” discussion arises. Firstly, ALL paper backed films have some orange peel it’s a function of the weave in the paper. It varies between manufacturers and even between rolls within a manufacturers supply. Premium films have no orange peel due to its plastic backing but do cost significantly more. When price comparing you need to ask WHAT film is being installed, what coverage is being offered and what warranty they are offering. This isn’t about length of warranty its about the content of the warranty. In Costing terms, typically “2 Ply Films” are more expensive than “Value Films” and “Premium Films” are more expensive than regular “2 Ply Films”. This is no different to the Vinyl market with car wraps, where laminated films are more expensive than non laminated. We routinely price on “2 Ply Films” and on a minimum bonnet coverage of 24" (often 30") but clearly “Full Frontal” installations are separate from this. Value films do have some longevity issues from a wear and tear perspective (Loss of Gloss etc) and generally should only be used for volume turnover fleet work. (think about the parts often fitted at the factory which is the OEM version of value films). “Film Yellowing” is VERY rare and the causes as you will see below, are almost always a photochemical interaction. The following relates to all PU (Polyurethane films). The following covers the key issues to be aware of. In six years we have had only two issues reported to us. Before launching into this let me just say that what I am about to post relates to ALL PU (Polyurethane) PPF films . No Film is immune to these products. It seemed to me to ascertain causes and embark on prevention rather than cure. What struck me as strange was that you could do thousands of cars and never see this then you would get one car that would throw up an issue. Film Yellowing could either be due to neglect or contamination. However we put 3M on our vans and didn't touch them for two years; nothing no movement no shift nothing. Clearly on a top coated film it wasn’t environmental. Toluene can be used in small quantities without adverse effects in concentrate form if left on film and not neutralised right after use it will cause yellowing. As a side issue Toluene will destroy Polycarbonate, do not EVER get this on headlights indicator lenses or Polycarbonate race windows if you have them, then make no mistake it is MERCILESS if using any tar and adhesive remover mask off all Polycarbonate components and get it off the film immediately. The most concerning element is anything containing Petroleum distillates (paraffin wax). Now the issue is this. There are two types of petroleum distillates Kerosene (Paraffin) based and Naphtha based. Naphtha based PD's are fine the deadly ones to film are the Paraffin based ones. So how can you tell? Well typically you can’t, in most cases the only labeling requirement is to state Petroleum distillates on the label, not which type. The safe course of action therefore is to avoid ALL of them. One rider to this is that we do know of one product "Turtle Wax ICE" which contains PD's however, we KNOW these are Naphtha based and are fine on the film (indeed we have used this for about a year in tests with no adverse effects). In all other cases avoid utilising this chemical makeup on films (anyone’s). As many will know, we have stated on numerous occasions on the internet that Paint Protection Film, in general, will NOT turn yellow, cloudy or milky etc. It can of course be made to appear as though it has. So what is the difference many will ask? If it looks yellow then it is yellow. Well not really, as actually turning yellow would be irreversible. However, appearing to have turned yellow is capable of being rectified. We have replicated this exercise on film stocks from XPEL, Avery, Venture shield and Scotchgard. The cause of these manifestations is purely and simply down to neglect. If the manufacturers after care instructions are followed correctly then most, if not all will never encounter this problem. 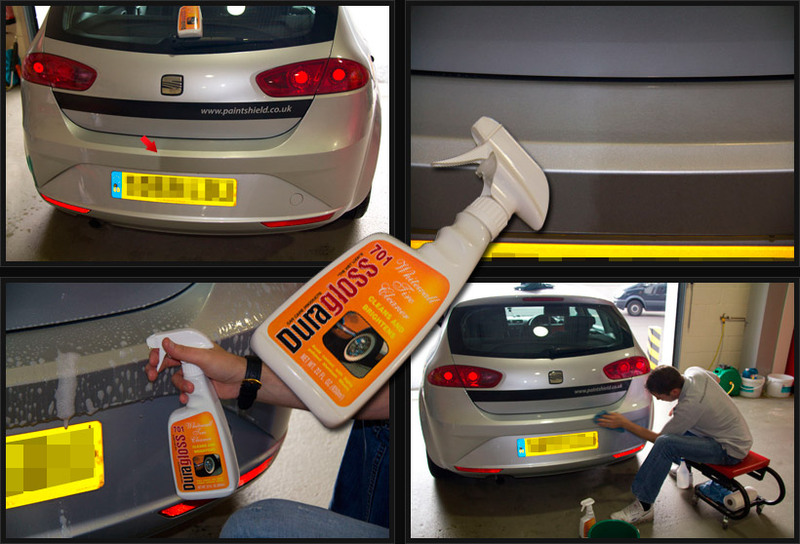 XPEL Flawless Film cleaner (excellent), Wesleys Bleche wite (A Shell product) and Duragloss White Wall Tyre cleaner. If the XPEL product is not available, of the other two the most effective was the Brothers Duragloss. For the purpose of this demonstration we used the readily available Brother's Duragloss. We installed a well known brand of film on the rear bumper of one of our courtesy/fleet cars and no aftercare other than washing was undertaken to induce neglect. (We recommend reading our film after care instructions, elsewhere on this site to prevent this). After a while and when the “film had appeared to have turned yellow” we then proceeded to clean Half of the bumper and as you can see the results were instantaneous. What you do is spray the Duragloss on the area to be cleaned, adding around the same quantity of water (50%) and agitate until it suds up slightly. This is important. Do not think that using it neat will work better as you need a surfactant to float the dirt out. Think of it like washing the dishes with neat Fairy liquid, it will not clean your dishes as well as Fairy and water!. In this example we used a lint free cloth but in extreme cases of neglect you may find that using a two inch sable paintbrush is helpful in coaxing dirt from deep within the pores. (Do not use nylon as that will scratch the film). We then went on to clean the remainder of the bumper. The total time to clean this off, less than five minutes. Once you have completed the process please ensure that you rinse the solution off the car thoroughly with clean water. As you can see the film hadn’t yellowed, the dirt just made it appear that way. We have stocks of the cleaning products available should you require them. Carnauba waxes generally are fine heavy yellow wax density waxes may cause a temporary issue however this is non permanent and if it occurs can be removed by stripping the old wax off, going back to the film and starting with a fresh coat of wax. In reality I have never seen this happen, however I know it is theoretically possible. If you decide to use a paint sealant over the film then check the contents carefully to ensure it contains no petroleum distillates. These products MUST NOT be used on films as they will turn films yellow. Most of you will never have come across this before, however, if you have a white car, sometimes a car dealership will use it when you have your car serviced to get the car quickly back to crystal white. When putting your car in for service if they offer to wash it check with them that they will NOT use a TFR on your car. Obviously with us (and some others) you could completely ignore this as if your film does start to yellow it will be replaced under warranty, however, it does save everyone (mainly you) a lot of potential hassle if you know what the cause is so that you can avoid it. The exact techniques used will depend on the source manufacturer of the film but basically they come down to two basic approaches, chemical restoration or buffing out. With 3M film you can use neat Isopropyl alcohol to restore the film and take the scratches out. If you have 3M film email support@paintshield-china.com with "3M" in the subject line and we will email you back the instructions. With Xpel Film, and Avery Film again email support@paintshield-china.com and put the film brand in the subject heading (if its one of ours just put Paintshield in the subject header with your VIN number and approximate date of install and we will get back to you with the instructions). With Ventureshield, we have been told that the XPEL/Avery solution MAY be effective, put Ventureshield in the subject line and we will send you these instructions. Bear in mind that with Ventureshield the techniques are not wholly proven so this will be at your own risk, that being said we have had some success. If you have a value film or a film that has gone yellow email us at support@paintshield-china.com and give us the manufacturer of the film and some pictures of the yellowing/discolouration and we will send you a document, that will help in most cases and bring the film back to an acceptable appearance. Once again email us at support@paintshield-china.com with the film brand in the subject line and we will send out what we have on the various films, gloss restoration is hit and miss with some films but a lot of the time you can bring it back. Now whilst this doesn’t happen to many people, if you are unlucky you may get the odd red or yellow bug blood stain on your film (you can help avoid this by regularly waxing the film). This is no big deal on MOST films this will bleach out in the sun, the blood does not penetrate the film but as some bug blood is used as a dye then it should be no surprise that this can occur. As Indicated this is ENTIRELY temporary with most films and will fade out over time in the sun, how long depends on the severity of the stain and intensity of the sun during bleaching out. This can occur If a car is not washed thoroughly enough as micro particles of dirt will adhere to the exposed adhesive giving an outline to the film. This is really easy to deal with we have a pack of four “magic Sponges” that used correctly will solve this issue (they are also great for tar and rubber deposits). Email support@paintshield-china.com with “magic sponge” in the subject line and a contact number and we will get back to you. The cost of these are £11.99 excluding VAT and including Postage (EU only) outside the EU postage will depend on location and type of forwarder selected. 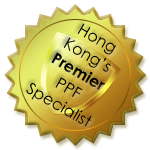 I Hope this has been of some use to those of you who have put PPF on your car and hopefully the information above will help you extend the life of the film and get maximum value for money.